In June 2014, Community Food Lab produced a program guide and toolkit intended to be used by anyone who wants to start a healthy corner store program in their community. This new resource is built from our six-month pilot study exploring the successes and challenges of healthy corner store programs. The pilot study was a collaborative project with Region 5 of the North Carolina Community Transformation Grant (CTG) Project, made possible by funding from the CDC. Community Food Lab partnered with five county health departments in urban and rural communities throughout NC CTG Region 5 - Caswell, Chatham, Durham, Guilford and Person - around the belief that successful healthy corner store programs take root by supporting lasting relationships between stores, health educators and other invested community partners. Our program guide and toolkit works as a step-by-step guide to help communities build the relationships and experience necessary for healthy corner store programs. We are sharing our report on the pilot study, Piloting Healthy Corner Stores: a 5-county study to build best practices for healthy corner stores, as a summary of best practices for starting healthy corner stores. 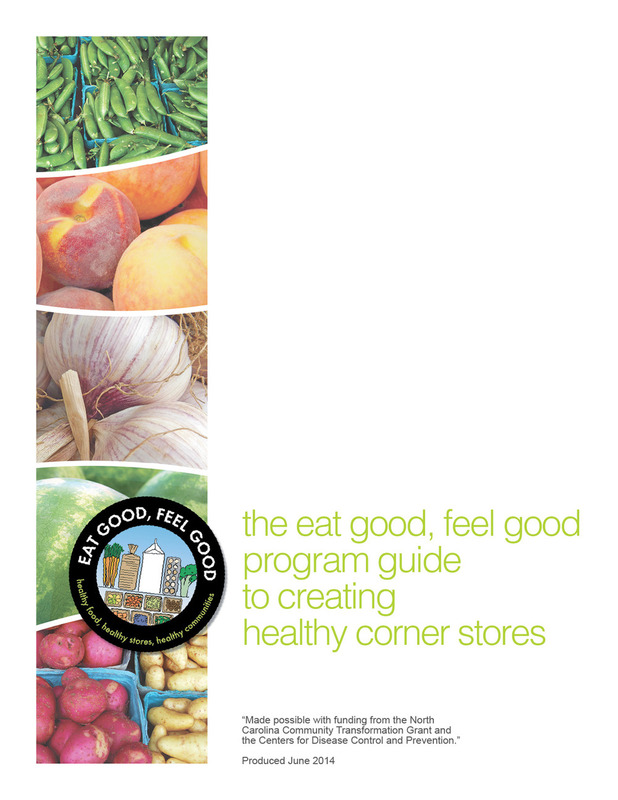 Our program guide and toolkit, The Eat Good, Feel Good Program Guide to Creating Healthy Corner Stores, is available here for anyone to pick up and use as they begin their own healthy corner store work. Why do healthy food options matter in corner stores? "Food deserts, defined by the United States Department of Agriculture (USDA) as ‘urban neighborhoods and rural towns without ready access to fresh, healthy, and affordable food,’ are a significant problem in North Carolina." "According to data available from the USDA Food Access Research Atlas, North Carolina has at least 349 food deserts across 80 counties. Over 1,544,044 residents live in these food desert zones. Residents living in food deserts are more likely to suffer from obesity, diabetes, cardiovascular disease, and other diet-related conditions, while simultaneously being more likely to be food insecure." Many families want to buy healthy foods, but these items can be hard to find in food deserts. For communities without a nearby grocery store, neighborhood corner stores are a likely place to shop for groceries. However, corner stores often stock few healthy items and lots of processed food, alcohol, and tobacco products. Corner stores are also often located near schools, parks and other community gathering places, making them a frequent stop for area youth looking for a quick snack. These corner stores are being recognized as opportunities to bring fresh and healthy food to areas where food options are scarce. By increasing healthy food option in corner stores, healthy corner stores are created that can in fact bring change to the food access landscape. Healthy corner stores have been shown to have many benefits, including increased consumption of healthy food, changes in food shopping behaviors, and new markets for local farmers. Our hope in sharing this work is that this guide adds valuable information and replicable models for solving the complex problem of inadequate food access for the central North Carolina region and beyond.